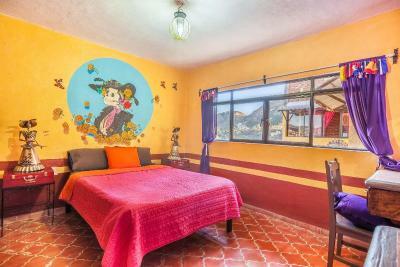 Lock in a great price for Hostal Casa de Dante – rated 8.9 by recent guests! Breakfast was excellent. The view is amazing. And the hosts speak English. The room was cute. Breakfast was delicious and the staff were super nice and helpful. 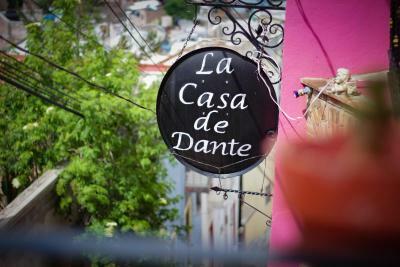 I really enjoyed my stay at Casa de Dante! The service and friendly staff are the best! They put so much love into the details and decoration of the hostal, my room had a freshly painted mural and poem that made a great vibe in the gorgeous room. The balconies and terrace are fantastic! The view is a joy to behold. The wifi worked great. Having a kitchen to use is a big plus. The food is very nice and it's fun to meet the other guests over breakfast. I liked the neighborhood and always felt safe. I met lots of nice people during my stay. The people who work there are really sweet and accomodating. I would love to stay at Casa de Dante again. Thank you so much to all the staff and owners for making a place with lots of heart and soul poured into it! I feel very lucky to have had the opportunity to stay with them, it is a gift to be their guest and they do an amazing job. Thank you!!! Very cost effective stay and spectacular views of the city. Location was very secure and felt safe as a solo female traveler. Folks at the hostel were mostly interactive during the breakfast hour. Nice open patio space to take in sunrises and sunsets. Rooms had the minimum needed for a basic stay and were clean. If you're a light sleeper, bring some earplugs cuz the windows can rattle a little from the canyon breezes and the roosters that crow in the morning (I thought both were charming). Staff were very friendly and helpful. Breakfast is delicious. Terrace is wonderful. Staff is extremely kind. They supply towels and water, and bed was already made, with extra blankets. An excellent hostel. It was perfect for me traveling alone. The staff was amazing. The location has its inconvenience, it is 15 minutes from the real center but has a beautiful view. The breakfast was stunning, you wouldn't expect such a breakfast in a hostel but definitely in a hotel: This si the thing that everyone will talk about. The rooms are great, spacious with good lockers and they give you a towel as well! Breakfast with Irene was excellent, the room was comfortable, beautiful view from the balcony and roof, staff was very friendly and warm. 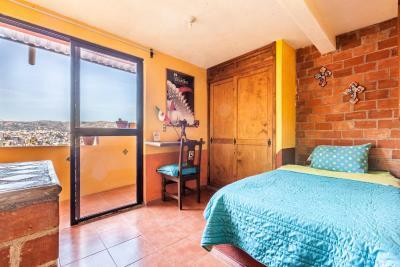 Hostal Casa de Dante This rating is a reflection of how the property compares to the industry standard when it comes to price, facilities and services available. It's based on a self-evaluation by the property. Use this rating to help choose your stay! 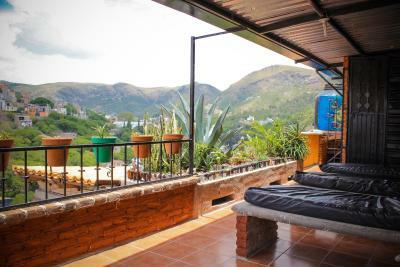 One of our top picks in Guanajuato.Featuring a roof terrace with views of the hills surrounding Guanajuato, Hostal Casa de Dante is an Adult Only Hostel just a 15-minute walk from the historic city center. This hostel offers simple accommodations with balconies. The property is located on the top of a hill and is accessed by a long, steep stairway of 150 steps. 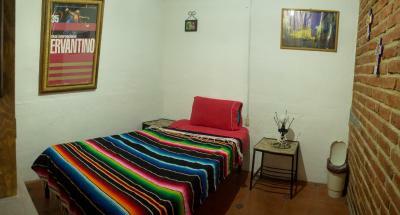 Hostal Casa de Dante features rooms with private bathrooms, as well as dormitories with shared bathroom facilities. 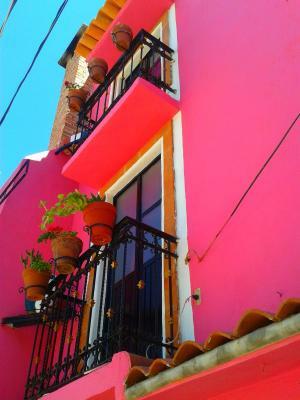 All accommodations has simple Mexican-style décor. The hostel serves a varied breakfast and there is also a kitchen for guests’ use. Free Wi-Fi is available in the Dante’s lounge. The property also offers a tour desk. 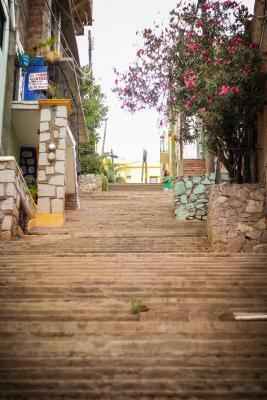 The center of Guanajuato is 15 minutes' walk away. 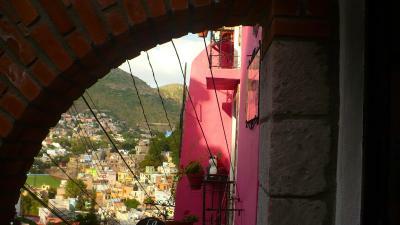 Sights such as Plaza de la Paz and the Juarez Theater are just over 0.6 mi from Hostal Casa de Dante. 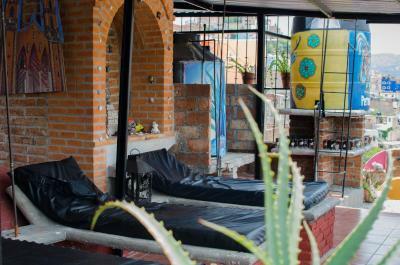 When would you like to stay at Hostal Casa de Dante? This simple room has a balcony with city views. This dorm offers city views and has a shared bathroom. 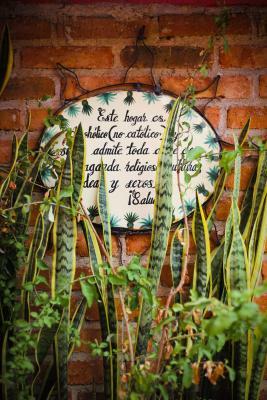 House Rules Hostal Casa de Dante takes special requests – add in the next step! Hostal Casa de Dante accepts these cards and reserves the right to temporarily hold an amount prior to arrival. Please note the that the property is located on top of a hill and is not recommended for people with reduced mobility, it is necessary to climb 165 steps or descend 197 steps. Please note that property does not have lockers or storage area. Please note that children are non allowed in the property. 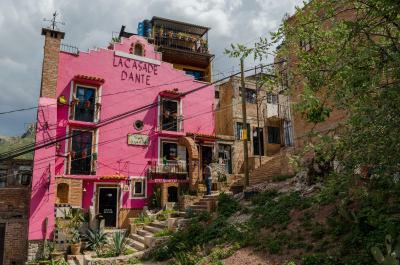 Please inform Hostal Casa de Dante of your expected arrival time in advance. You can use the Special Requests box when booking, or contact the property directly using the contact details in your confirmation. The kitchen was tiny. Although the beds were single and not bunk bed style in my room I don't think I would have liked sleeping in the middle bed as they were quite close together. Bed was comfortable with lots of covers to suit different needs. Huge lockers. Bed was remade for second day. Towel and soaps provided. Great people, clean room, nice rooftop and delicious breakfast. Many thanks! The pillows and mattress were rock hard. And the Wi-Fi didn't work for the second half of stay from our room. The breakfast was delicious and was very accommodating for vegans. The view was absolutely amazing and definitely one of the best available! Be aware. You will have to walk up the stairs most days to reach the hostel, but the accommodation make up for it. Great Hostel that exceeded our expectations. We had a beautiful room with a nice view, the staff is extremely kind and helpful. Would definitely stay again ! I love Casa de Dante! It is more than perfect at its price point. It is true that there are many dogs in the neighborhood and if you are lucky they will quiet down for a couple of hours each night, but earplugs are mandatory. The shower did not work well, even in the afternoon I could not get any hot water, but the nice room and great views made up for it. I learned a lot of patience by staying relaxed about the manners and behavior of other guests who were mostly great and fun to meet. The staff cleans very nicely which remedies the situations of the night before. Best breakfast ever and it is restaurant level good...friendly stuff gave useful info...loved the rooftop with wonderful view...room is clean and cozy..totally exceeded my expectation..would come back again!!!! the staff is very helpful, the breakfast is delicious, and the service is very good too. the room is huge and comfortable. Ok - there are A LOT of stairs. And I mean uneven, steep, choppy stairs. Booty burning workout. If you drink heavily, have physical limitations, or pack a lot of wheeled luggage you need to find another location. I travel light (duffel bag) and was prepared for the stairs based on other reviews. The hostel is in the middle of the hillside so be sure to get a cab to drop you off at the top of the stairs. I climbed up from the bottom a few times and counted 165 stairs to the door. You can't even get a photo of the stairs in one shot, lol. On the positive side, the view is FANTASTIC, so if that's what you want, just figure out how to make the stairs work. I liked everything. I even stayed one more day than expected.